The Norwegian Gem during sea trials (underway currently); she will be delivered in October 2007. 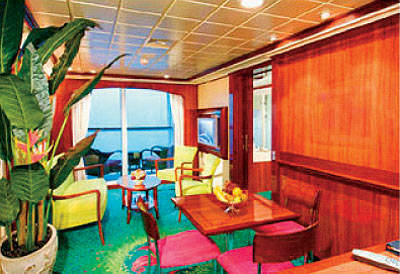 The Garden villa accommodation onboard. The Courtyard villa accommodation onboard. 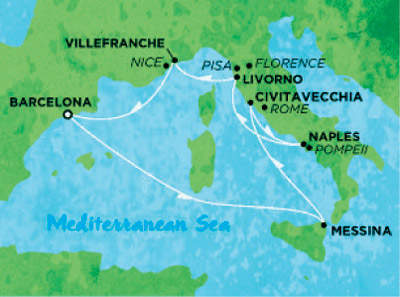 The likely Mediterranean routes for the Norwegian Gem. The keel laying ceremony at Papenberg. In mid-2005 Norwegian Cruise Line Corporation (NCL) announced a new ship order with Meyer Werft, in Germany, for delivery in October 2007. The 93,500t vessel, which will be called Norwegian Gem (hull S.670), will have 15 decks and a capacity of 2,400 lower berths (1,200 cabins). 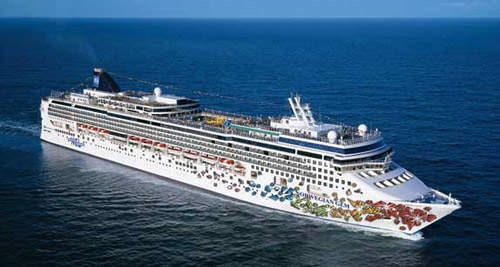 It will be a sister ship to Norwegian Jewel, which was delivered in August 2006. The contract price for the ship was approximately $510m. 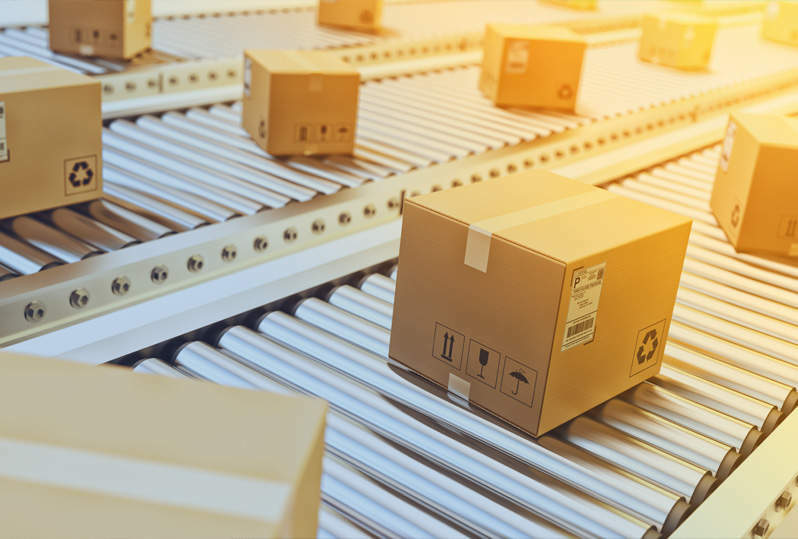 This new order will be the tenth big new ship to join the NCL fleet since the fleets modernisation began in late 1999. 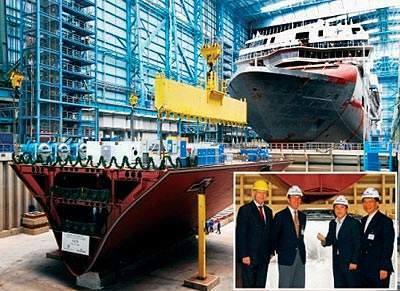 Once this tenth ship is delivered in October 2007, over 75% of NCL’s inventory of beds will be on ships less than eight years old. Purpose-built for freestyle cruising, Norwegian Gem will comfortably transport 2,400 guests and over 1,000 crew at a speed of 25kt. The ship will have over ten restaurant options from steakhouse to sushi and family friendly accommodations with a full range of kids and teen facilities and clubs on-board. The ship also offers guests a wide array of public bars and lounges, extensive sports and fitness activities and staterooms designed with rich cherry wood finishing. The Bora Bora Health Spa and Beauty Salon is operated by Mandara Spa, which fuses eastern and western-style treatments. The sports deck is open for basketball, volleyball and tennis. The onboard Body Waves Fitness Centre features state-of-the-art equipment, a hydrotherapy pool and classes. The ship features a wired internet cafe and a photo gallery with special kiosks for making digital prints. The ship will also feature a rock wall climbing facility and a bowling alley. Passengers can use any of the restaurants, including Cagney’s Steak House, Blue Lagoon, Mama’s Italian Kitchen, Tangos (tapas bar) and NCL’s signature restaurant, Le Bistro. The main restaurant, Tsar’s Palace, has a Russian theme with gold ceilings, shining chandeliers and ornate balustrades reminiscent of Faberge eggs. Dancers add to the ambiance at the Asian-inspired Chin Chin and pop art punctuates the scene at Azura. Bars and public lounges are available throughout the ship; these include Bar Central, Shaker’s Martini & Cocktail Bar, Magnum’s Champagne and Wine Bar and the Maltings Beer and Whisky Pub. The ship also features the unique Sky High Bar (a beer garden that looks like a hot air balloon). Staterooms feature a vast array of amenities, including rich cherry wood finishing, television, refrigerator, safe, duvet and bathroom with shower and hair dryer. Suites and penthouses feature floor-to-ceiling glass doors and a private balcony. The ship also features the unique Garden Villas accommodation (570ft²), featuring a living room, dining room, three separate bedrooms, each with king- or queen-size bed, private luxury bath and CD/DVD library. One bedroom has a full bath with tub and shower. A butler and concierge service is available. There is a private courtyard area with pool and sundeck. A new category of staterooms called Courtyard Villas features floor-to-ceiling glass doors, private access to a courtyard with pool, sundeck, hot tub and cabanas, steamroom and fitness equipment. The two deluxe Owner’s Suites (pearl suites) (685ft²) offer a private balcony, living room and dining room, separate bedroom with a king-size bed and a luxury bath with separate shower. Again there is a private courtyard area with pool, hot tub and sundeck. 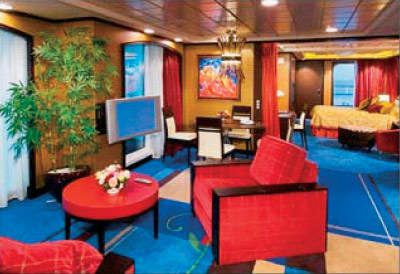 Norwegian Gem’s range of exclusive decks and cabins are, in effect, a restoration of the ‘class’ system on cruise ships. 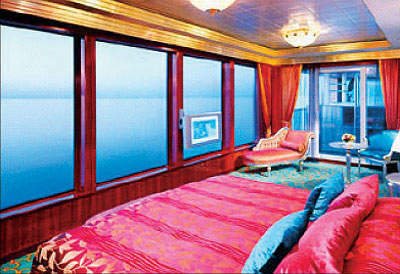 There will be a total of 540 staterooms and suites with private balconies. In June 2006 at the Papenburg ship yard, one of a total of 67 steel blocks of the Norwegian Gem was put into place on the keel blocks. Mr Loui Keong Hui, son of Tan Sri Lim, Chairman of Norwegian Cruise Line, was at the ceremony to lay the traditional ‘lucky penny’, before the 350t, 20m long, 27m wide and 9m high block was laid. The ship’s length overall will be 294.13m, the breadth is 32.2m. The ship will be able to reach a speed of more than 25kt. The ship’s construction will use the latest laser welding and laser cutting technologies.